About a month ago, Hollywood actress Drew Barrymore, one of the lead stars of zombie-like comedy web television series, "Santa Clarita Diet" flew to the Philippines to promote their show in the country for Netflix Philippines and to official launch the premiere of the show's 2nd Season. A few days after that, "Santa Clarita Diet Season 2" is aired in the web streaming entertainment website, Netflix. Since it's promotion, the hype that Drew Barrymore brought to the country and due to the popularity of the show lead Netflix to announce the renewal of the said web television series for its 3rd Season run. A 10-episodes Season 3 series is slated to be shown next year (2019) with all-new exciting and sometimes gorey episodes on Netflix. 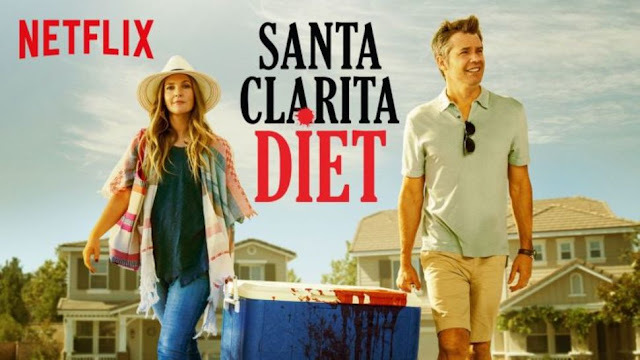 Joel (Timothy Olyphant) and Sheila (Drew Barrymore) Hammond are everyday suburban real estate agents in Santa Clarita, California. The couple face a series of obstacles when Sheila has a physical transformation into a zombie and starts craving human flesh. With Joel and the family trying to help Sheila through the trying time, they have to deal with neighbors, cultural norms and getting to the bottom of a potentially mythological mystery.